In February, a Congressional Budget Office study compared the two approaches, concluding that “a tax would be roughly FIVE times as effective at reducing greenhouse gas emissions as a fixed cap.” Read that again. Better yet, read the report. So spending a lot to meet a fixed “cap” in one month doesn’t help as much as spending that same money to make larger (cheaper) reductions over a longer time. Setting a price for emissions creates the incentives for our economy to become a marthoner. We face a long race and we have to run it smoothly and efficiently. No point in exhausting ourselves on jackrabbit leaps. The CBO report explored ways to modify a cap and trade system to make it more efficient (more like a tax), including auctioning permits and a “safety-valve” to limit the unpredictable and destructive price spikes that led to the collapse of the RECLAIM cap and trade program for smog emissions in southern California. Similar price spikes are now showing up in the European greenhouse gas emissions trading system. But why introduce the middle-men — the traders who create and profit (or lose) from speculative volatility and skim money off the table? They’re already circling like hungry piranhas. Northeastern states are setting up a (complex) Regional Greenhouse Gas Initiative (RGGI), a cap and trade system. Initially, the cap is set higher than emissions levels and permits are auctioned off. Then the cap will be tightened, limiting supply, driving permit prices up. Like musical chairs — take one away each round. Trades conducted in anticipation of the Northeast’s nascent greenhouse gas trading market reveal a bullish attitude among traders… possibly prompted by the specter of federal pre-emption. According to consultancy Point Carbon, at least two [large] transactions have occurred well above the market’s reserve price, sending the first concrete price signals to states, utilities and traders awaiting the nation’s first binding emissions cap. Similarly, carbon prices on the Chicago Climate Exchange have shot up since Super Tuesday, when it became evident that all three presidential candidates supported a national emissions cap (ClimateWire, April 7). 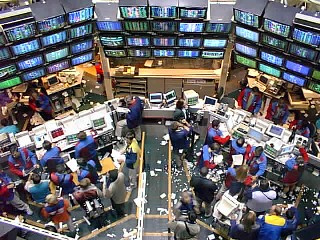 Traders could also be taking their RGGI cues from that market, Bugnion said. High credit prices would give states more revenue to spend on energy efficiency, but they could also hurt ratepayers, she added. “Too much money is not necessarily a good thing,” she said. Traders’ expectations and Bugnion’s comment reveal much about the difference between cap-and-trade systems and a revenue-neutral carbon tax. Proponents of trading schemes like RGGI appear willing, even eager, to hit (electricity) ratepayers in the wallet to fund state energy efficiency programs. While these programs have proven highly valuable in reducing institutional barriers that impede energy efficiency, the effect is typically regressive. Low-income people spend a larger share of their incomes on utilities (and energy in general) than those of high income. But even then, two big problems with cap-and-trade will remain: price spikes and fat-cat traders. The “safety valve” is a way to blunt cap and trade’s price spikes — simply open the valve if the price hits a pre-determined limit. Helpful, but a long way from a tax: the smooth, even marathon pace that gets us to the finish line. Plus, the safety valve eliminates the emissions reduction “certainty” touted by cap-and-trade proponents. Remember, it’s a marathon. We can’t afford the jackrabbit starts of price spikes and the extra weight of traders. Good article. Please take a look at the debate I have started on the new website debatewise.com about whether Emissions Trading is an effective way to deal with climate change. Anyone can add points and contribute to the debate. I agree that introducing an entire industry of people whose job it is to trade carbon credits seems like dead weight in a critically important system. Like all the employees of insurance companies, and the people the doctors’ offices have to hire so they can follow the billing and other procedures to be paid by them. There are a lot of extra employees who have to be paid so you can spend 20 minutes with the doctor. A tax will still need enforcement, but it seems it would be a smaller infrastructure. Also, I think the piece about (carbon tax or cap and trade) being revenue neutral is pretty appealing. I’d like to see that make it all the way through to finished legislation. For some reason cap-and-trade as a way to reduce emissions is appealing to state regional groupings such as the RGGI. If this sub-national group is willing to go ahead with cap-and-trade why, we might ask, are such groups, or even states alone unwilling to work with a carbon fee? In Europe at least one country, Finland (there may be others), has carbon fees in place. Does that affect Finland’s competitive position in (with?) the EU? What would be the impact of a state establishing phased in carbon taxes as a way to raise energy costs?A recent study done for the North Carolina Sustainable Energy Association (NCSEA) showed that low cost energy states in the Southeast actually spent more in dollars to produce each $1 million of state GDP than did high energy cost states. Could we actually argue that the energy efficiency resulting from state carbon fees would make so called low energy cost states more productive? Does anyone know of any data on this subject? Public Policy Virginia is studying this issue to influence state policy makers. To Mr. Weed’s thoughtful questions, I’d say it’s clear that replacing taxes on wages or income with fees on carbon emissions would create advantages for states or even cities. They’d be attracting jobs, promoting alternative energy and energy conservation. "Tax Carbon Burning, Not Wage Earning" to paraphrase Gore’s suggestion (in his latest slide show). Another "revenue-neutral" approach: distribute the funds from a carbon fee equally, per capita. It’s a stimulus: like the $600 checks IRS is issuing (once) to dampen economic recession. But we’d get carbon "dividends" month after month. And it’s progressive: for those whose fuel use is below average, the "dividend" would more than offset the tax on fuel and on "embedded" fossil fuel energy in other products. A win-win, with no "traders" to game the system, no price spikes to thow off budgets. Much easier (and faster) to set up and enforce than complex cap and trade schemes. Thanks for the excellent article! I just can’t understand why environmental groups aren’t flocking to this simpler, more effective solution. Why would anyone prefer cap-and-trade, with the dead weight of traders, the inefficiency of price spikes, and the regulatory morass needed for enforcement? Let’s go for a single, consistent, simple system where every consumer of energy will have the correct price incentives built in for reducing carbon emissions. You’re right David, even with progressivity and revenue-neutrality to offset the income effects, some individuals and industries will be hurt by a carbon tax. Oil-drilling, highway-building, trucking for example. But at the same time, new, green industries, like building wind farms, transit systems, retrofitting houses and buildings for energy efficiency will be spurred. The net effect will be more jobs and more income. Assistance (training in the new green jobs, for example) to those displaced by the decline of high-carbon industry must be a part of any climate legislation. You’re also right about the politics of selling the idea — we have work to do. But a per capita carbon "dividend" or reduction in payroll or income taxes should be popular. Strikes me that a carbon tax is to a cap and trade system as single-payer universal health care is to the wacky, convoluted health care systems being proposed by Clinton and Obama and others that attempt to cover more people, while still cutting in the insurance industry. Cap and trade and the typical health care expansion proposals are both bureaucratic and inefficient – apparently intentionally cutting in vested interests in order to gain their political support. Do any of the cap and trade proposals, including RGGI, have a steady annual reduction in the allowable emissions of each plant? I have not gotten a clear answer on this. If in fact there are proposals that would reduce the allowable emissions by a fixed percentage each year, say 5%, then we have, in effect, a program for phasing out fossil fuel power plants. But everything else we read and hear suggests otherwise: that no utility, especially the coal utilities, have any intention of phasing out operating plants before their full lifetime. So I would appreciate some clarity on this issue. Also, does anyone have any ballpark estimates on the middleman profits being made and to be made on carbon trading? And who is getting them? Lorna (Comment #10) — Good questions. Re RGGI, you might try their Web site, http://www.rggi.org. Ditto, EDF’s and NRDC’s Web sites re their cap-and-trade proposals. For what it’s worth, it would take 40 years of 4% annual reductions to reach an 80% reduction from 2010 levels by 2050 (which is what EDF/NRDC say is their goal). If you find out anything, please report back in this space! Thanks. — CK, co-director, CTC. Lorna – Cap-and-trade does not require that a specific plant reduce its own emissions. A plant owner can either reduce plant emissions or buy allowances in the marketplace. As long as there are relatively inexpensive allowances available on the market, for example through offsets or a poorly designed program, there will be little pressure to shut down individual plants. One example of a poorly designed program would be cap-and-trade with a relatively low safety-valve, such that the market price of an allowance would not exceed a certain level. On the other hand, a cap-and-trade program with a low enough cap, without a safety-valve and with 100% allocation of allowances would eventually provide a powerful incentive to shut down inefficient coal-fired plants. I’m not betting on such a cap-and-trade program coming out of Congress. At the regional level, RGGI doesn’t have a tight enough cap and it has a safety-valve, so it won’t be enough to force coal plant closings.